The bill was due to be voted on last night – but debate concluded after a decision had been made on a number of amendments. THE DAY AFTER it began, the Dáil debate on the abortion bill was adjourned – with the certainty that it would be only a few hours before deputies would be back in the chamber again. 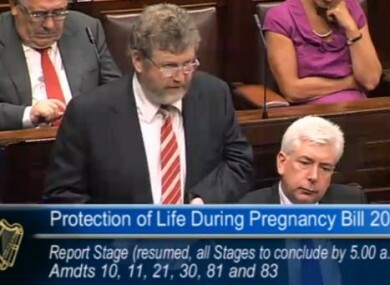 The Protection of Life During Pregnancy Bill 2013 was discussed throughout the day yesterday, with a plan to take a final vote on the bill by 10pm. That was then pushed back until midnight, before a vote was taken at 10pm to conclude the debate at 5am the following day. That vote passed – though not without being called ‘farcical’ by Fianna Fáil leader Micheál Martin, who said that opposition whips had not been informed of the decision – and debate continued into the early hours of this morning. An amendment on removing the suicide clause from the bill was rejected. Also rejected were amendments that would have allowed for fatal foetal abnormality and inevitable miscarriage as grounds for termination. Much of the talk centred on the amendments tabled in respect of section 9 of the bill, which deals with suicidality. Deputy Brian Walsh said that this is the only element of the bill he has serious difficulties with. He said it “threatens to defile the statute book with the absurd premise that the suicidality of one individual can in some way be abated by the killing or the destruction of another human being”. According to Walsh, the government has “ignored” everything that the experts had to say during the two sets of Oireachtas hearings and it has come up with a bill that is shaped by political considerations rather than medical evidence. He said that abortion is no more a treatment for suicidal ideation than suicide is a treatment for suicidal ideation. Deputy Michael McNamara said that people on both sides of this house will vote with their conscience. Fine Gael Deputy Peter Matthews, who voted against the bill last week, said that life is “an extraordinary gift” and mothers and babies are extraordinarily valuable human beings, which is recognised by the constitution in Article 40.3.3. He said that evidence shows that a threat of suicide is not medically dealt with or treated by a termination of pregnancy that could end in the destruction of life of that baby or damage to that baby. This is future children. This is little babies, let’s make this a better country so that women don’t have to go to England or France or America, four and a half thousand of them. Sinn Féin deputy Caoimhghin Ó Caoláin described section 9 as an integral and necessary part of the bill. Ó Caoláin also said that “this is a time for all legislators to step up to the plate and to lift their heads from the sands”. “We have to do the best we can and presume that we are doing the right thing. We have to do the right thing by ourselves, and by the constitution,” said Deputy Bernard Dunne. He said that the bill gives an opportunity “to come out of the valley of squinting windows and to come into the light and recognise some of the debate which has been targeted at some of us over the past six months for what it is and the undercurrents displayed therein”. He put it to the house “that there is an undercurrent of disrespect for women, suspicion of women, suspicion that woman are liable to do the wrong thing and that they will go for in this particular case for abortion at every circumstance”. Dunne said he thinks that is an injustice. Fine Gael TD John P Phelan, who it was thought would not be voting for the bill, confirmed it would be getting his vote. Junior Minister Kathleen Lynch said that the tragic death of Savita Halappanavar had “made this country far more sensitive to pregnancy than we have ever been” and that within the many aspects of the debate “the woman and the baby gets lost”. Among the comments Health Minister James Reilly made was that “when the statue book is silent on matters of life and death, great mischief can occur”. He said this will be remedied with this bill. He added that abortion is never a treatment for suicide, just as counselling, psychiatry or other elements are not ‘treatments’ for suicide. Minister Reilly said that what needs to be done is looking at what are the causes of suicide and what can be done to address those. The Minister also rejected the contention that the bill will normalise suicide. Deputy Mick Wallace, who will not be voting for the bill, said he hopes the legislation brings some clarity, but that to him “it looks as if there is a lot of confusion still around”. Deputy Jerry Buttimer spoke about trusting women, saying: “We must trust our women of Ireland; we must trust our mothers. Let’s have a leap of faith on behalf of our women”. He said he has struggled with the bill but that he supports it. Junior Minister Lucinda Creighton asked Minister Reilly to put down “an alternative amendment to set out a legitimate care path that could provide care” to a woman who is pregnant and suicidal. An amendment put forward by Peadar Tóibín on section 9 was rejected. The discussion will continue on the amendments tomorrow, with the final vote due to take place following the debate. Email “Debate on abortion bill adjourned at 5am”. Feedback on “Debate on abortion bill adjourned at 5am”.